Healthy Valley is a community-wide effort aimed at improving the health and quality of life of residents and the community by making the Valley a better place to live, work, raise a family, and enjoy life. Preserving our Environmental & Historical Resources —For the past several years, Healthy Valley has focused on promoting and preserving the Valley’s environmental and historical resources, particularly those related to our river heritage. 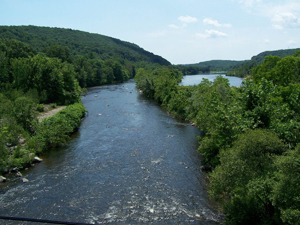 In collaboration with the Greater Valley Camber of Commerce, we have undertaken a legislative campaign to approve a National Heritage Area along the Naugatuck River, under the National Park Service Program. For more information about this initiative, please see our Naugatuck River Valley Brochure and website is currently under construction. Valley Bus Tours—Healthy Valley organizes yearly bus tours to introduce residents to the wonderful resources of our Valley. Healthy Valley Task Force Meetings—We hold monthly meetings of Valley community members, business representatives, and others interested in working to preserve and promote the Valley’s natural and historical resources. Improving the Health of Our Community—The Valley Council for Health & Human Services has continued Healthy Valley’s vision of working towards improving the health of our community. Most recently, we collaborated with the Naugatuck Valley Health District in leading a participatory process to develop a Naugatuck Valley Health Improvement Plan. You can read a copy of the plan [coming soon] and find out how to get involved in helping to achieve its objectives. For more information about efforts related to the specific needs of young children and senior citizens in the Valley, see the Early Childhood and Senior Services task forces. Healthy Valley was launched, under the umbrella of the Valley Council for Health & Human Services in October 1994 as the first Healthy Communities project in the state of Connecticut. The grassroots initiative involved about 200 Valley community members in identifying and addressing community needs, leading to numerous projects to make the Valley a better place to live. A detailed history of Healthy Valley and its impact to date is available here (link to pdf doc, or on Healthy Valley Archives on current website for now). The vision developed in the mid-1990s still inspires work today. We are taking responsibility for creating and developing a community which celebrates our rich cultural and spiritual diversity. We are working together to increase Valley pride. We are working together to identify and develop more effectively those things that make the Valley unique – our natural resources, our rivers, our historic buildings, and our people. We are working to develop a natural environment that is clean, aesthetically pleasing, makes full use of our green spaces and waterways, and is enjoyed by young and old alike. We are working together to build a vibrant, long-term Valley economy with decent jobs for all and a regional business outlook. We are working to bring top-notch health and wellness programs that nurture mind, body, and spirit to all Valley citizens. We are working together to develop Valley schools, and continuing education and training efforts that are second to none. We are working to integrate local schools so that we draw on the unique and complementary strengths of each. We are working together to ensure that our political system truly is by Valley people and for Valley people. We are listening to our youth, actively engaging them in all aspects of community life, and creating an environment which encourages them to reach their full potential. In all our work, we citizens, government officials, business, non-profit, and religious leaders of all six Valley towns are working together to increase Valley cooperation and pride – realistically, consistently, and persistently. We, the citizens of the Valley, want our actions to match our words, hopes and dreams. That is why we are working together to make our vision a reality using our strengths and our abilities. This vision will constantly be revisited and revised to incorporate new input and ensure it represents the collective vision of the community.